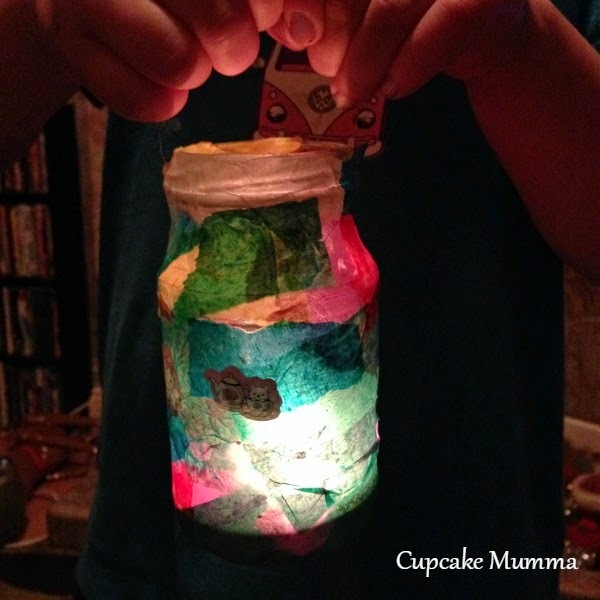 I've never made homemade lanterns before so thought I'd give it a try with the little ones! It was a rather spontaneous decision to make these, so I'm not going to say I'm absolutely right in the materials I've used, but we used what we could find and we had fun! Midge and Little A (with my help- because I couldn't resist!) stuck the tissue paper randomly to their jars and then covered the paper with more PVA so the paper wouldn't rip and come off the jar. It all dried pretty quickly and they stuck some stickers on their jars so they could tell whose was whose. We waited until outside had gotten a bit darker and dull, then we drew the curtains and switched the lights in the playroom off. I was so pleased with the results! A quick photo before heading to the playroom! They work! Naturally not a very clear photo in that light, but you get the idea! I had so much fun doing this craft with the little ones and I can't wait to make it again the future, they are both up for it. Why not give it a go yourselves? Perhaps a nice craft to see the New Year in? 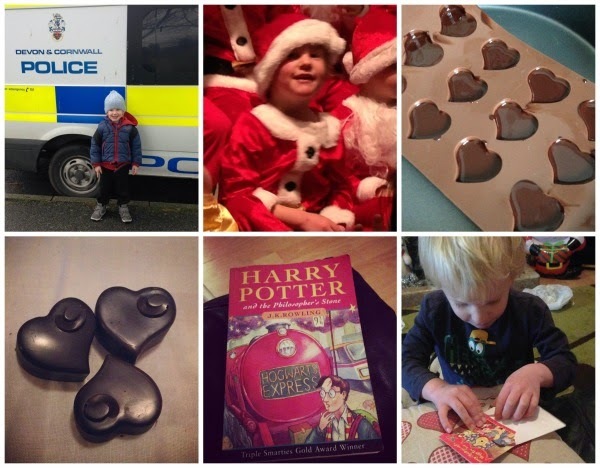 Speaking of crafts, i'm going to be joining in with Let Them Be Small over 2015 with The Crafting Prompt, a crafting challenge for you and the little ones. Here's the first 4 weeks of crafts. Do visit Sarah's blog to find out more! Well there's another Christmas done and dusted! I really enjoyed our family Christmas this year and the countdown to it more than I think I have before actually. 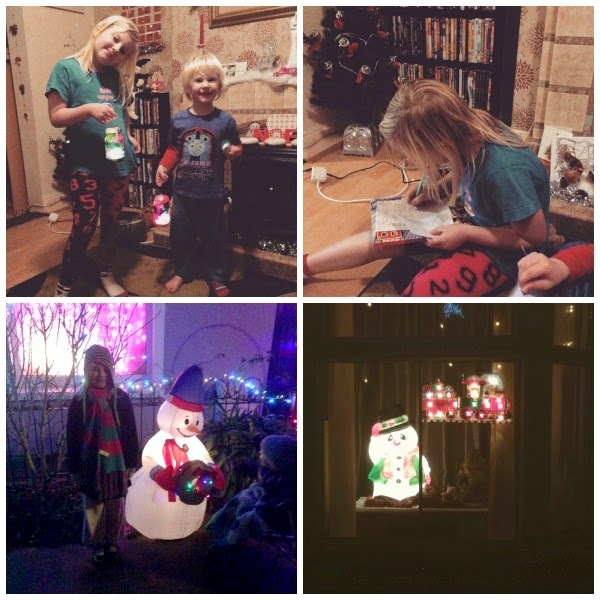 On the Monday we made homemade lanterns and had a super lazy day. It was just my little ones and me because Jay had to work until 9pm. I do hate Mondays but you can't always sulk can you! We also sat down and wrote our letters to Father Christmas. Midge took great care with her letter, Little A did a nice big scribble having not mastered any writing skills whatsoever just yet, even I had to write a letter to Father Christmas and I've not done that in years! I'm glad I did because it showed Midge how you should write a letter, not just dive in asking for this, that and the other! 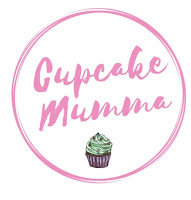 Tuesday was what we in the Cupcake House refer to as 'Christmas Eve, Eve.' My Mum came over which the children loved. We did some shopping for food in the morning, just grabbing a few bits then again in the afternoon when Grandma arrived we added the bits we couldn't find locally. All stocked up we went home for a picky tea and then pulled on all our warm clothes for our traditional neighbourhood walk, where we look at all the pretty Christmas lights that our neighbours put up every year. Snowmen that light up, trains in windows, outdoor trees and roofs covered in lights- just amazing! Wednesday was Christmas Eve and it was actually a very calm affair! The previous night I had placed the teddy elves from our small tree underneath our larger tree and sat behind them were 2 gift bags. I love doing Christmas Eve gift bags because the children are occupied whilst I get on with things. 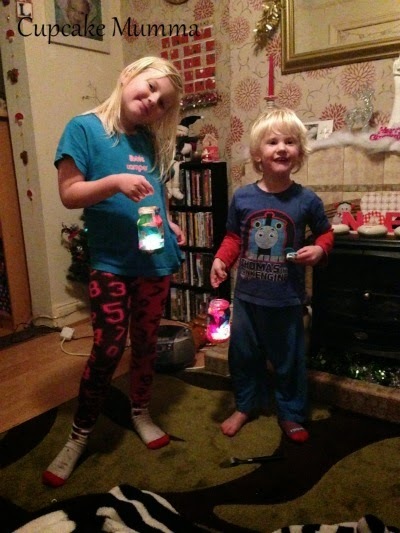 They had a craft, some pajamas, a new Christmas DVD, a treat box and an activity book (all from poundland bar the pj's!) I sat with them and made the Christmas trees because Little A found them a little difficult but I really didn't mind. 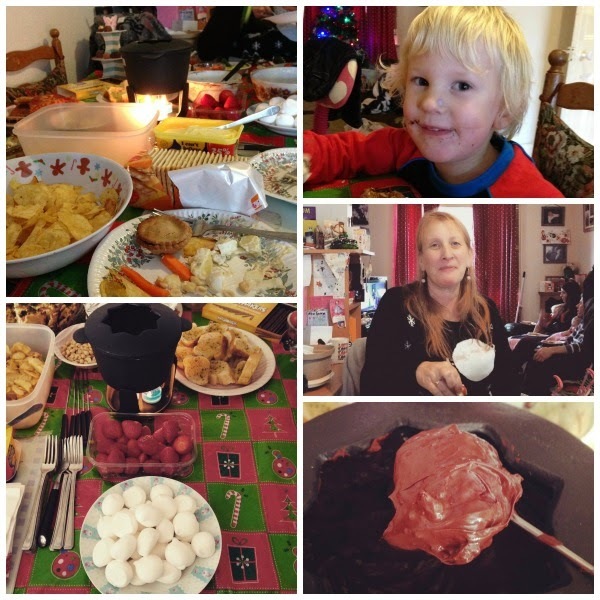 Hubby finished work at 1.00pm and family arrived at 2.00pm, by which time I had laid out a spread on the dinner table, including fondue set with strawberries and marshmallows! 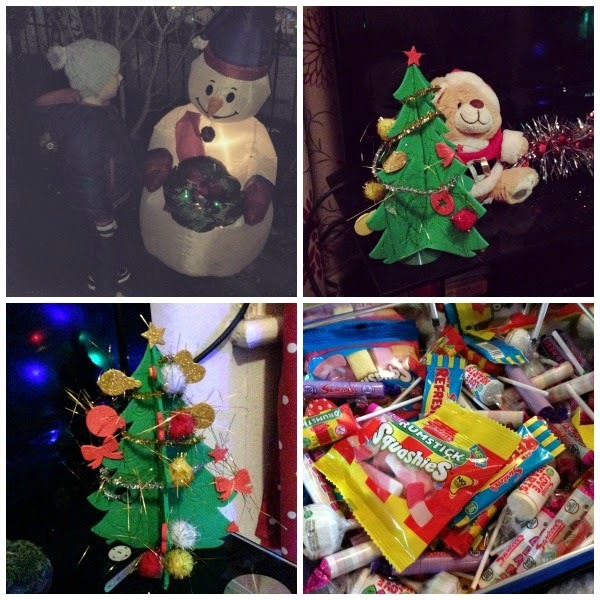 Snowman part 2// Little A's Christmas tree// Midges tree//Mummy's sweets! Christmas Day was an unusual one and not the one I expected. 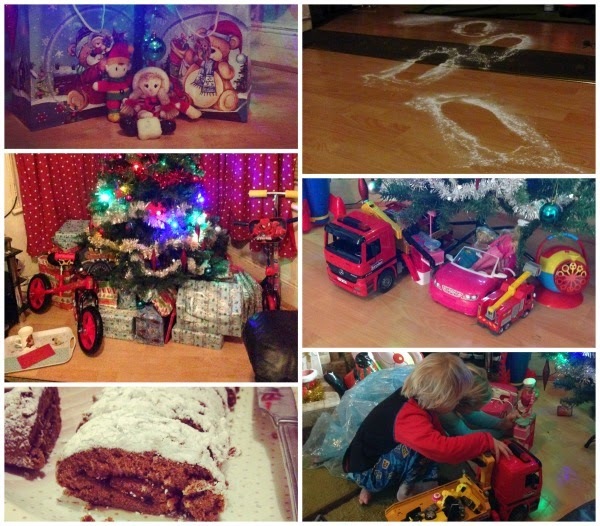 The morning was fantastic with all of us opening our stockings in my bedroom followed by the children finding Father Christmas's footprints in our front room (actually from the front door to his mince pies to be exact!) We opened our presents and had a yummy breakfast before different members of the family arrived here and there. My parents and sister arrived which was lovely but as the day went on it wasn't very festive. Dinner was incredibly late and Little A gave me a few anxious hours with his croup, which just came out of no where. We did have a delicious dinner and went to bed very full and exhausted! 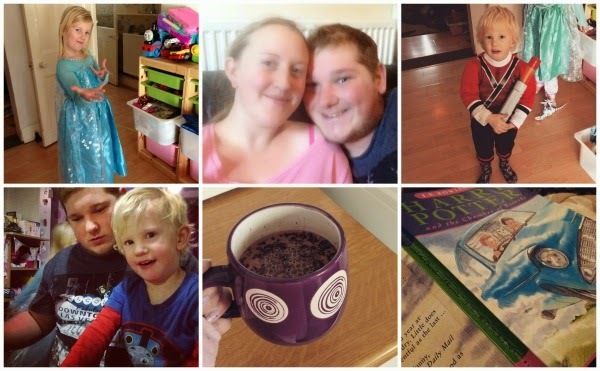 We've spent the time since then playing with new toys, dressing up and going nuts on scooters (the little ones) eating a lot of chocolate of the American variety (Hubby) and reading, drinking hot chocolate and catching up with my penpals ready for the New Year (me). 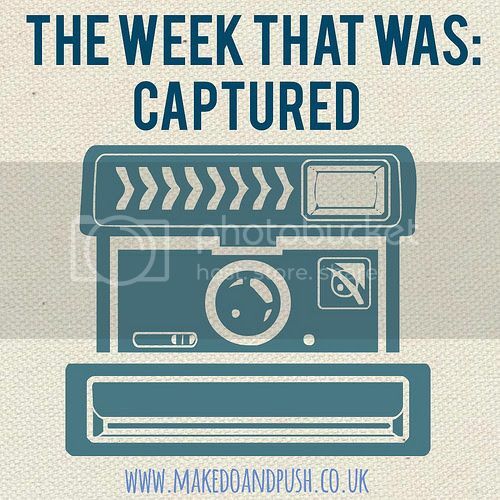 Phew, what a week! I hope it was a good one for you too lovely readers. Next week, I'm celebrating New Years with my parents and babies. It'll be odd not being with Hubby...I don't have any other plans because I'll be mentally preparing for those blasted school runs!! We have had a lovely few days and this Little Miss has enjoyed it more than most with her large amount of Frozen gifts from various family. We bought her this Elsa dress for a bargain (no other way!) and she's not taken it off for days! Fixing The Future with Sugru! As for me, well, naturally I don't think in terms of DIY or mending broken items, I think crafty! So I spent an evening making two rather sweet little models. A mushroom which I can easily turn into a badge/broach/keyring and a funny little worm which will become a keyring! Like sticking my sons train track bridge together. It always comes apart and it upsets him a lot. Not anymore! It's not as neat as i'd like it to be but it's a very awkward object to stick together. I also got the chance to finally mend my beloved skiing Cheer Bear Carebear. She was dropped a while ago and I've only just found the missing ski! I was gutted when she broke but now Sugru has fixed her right up. I still have more left and I'm sure it'll all come in very handy. My husband usually tapes everything up but now he has no excuse for that horrible habit! Sugru dries in a fairly quick time if left alone and it does dry rock solid. 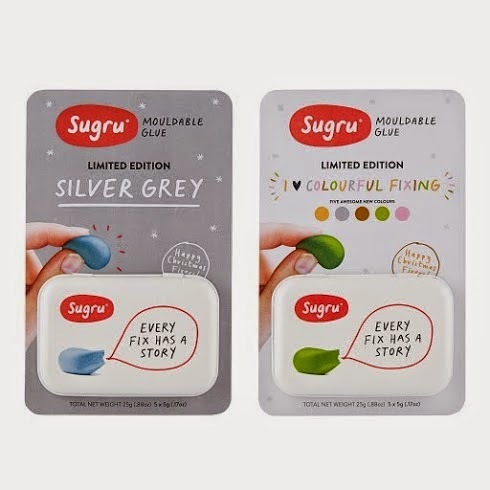 It's worth remembering that just like real clay and playdoh, if you don't look after Sugru it will become rock solid if left lying around and will get covered in bits if you drop it etc so do remember to pack it away again when you're finished! Sugru is a long lasting mouldable clay and is also very strong. I have seen photos of this product holding up pans after being moulded into hooks and stuck on to tiles! It is also waterproof which is very handy if you need a temporary fix in the shower or around a tap before you can get to the hardware store. So basically, whether you're into make do and mend, DIY or crafts, Sugru really is a product anyone can make a use of! Crafty Creatives have kept us waiting and wanting and now finally we have the long awaited Paperhaul box in our stationery loving hands. Paperhaul is a monthly box filled with a selection of postcards, tags, tapes, cards and stickers with each month bringing a different theme to the box you receive. In my first box I've counted 12 items packaged in a flat parcel box perfect for those of us destined to almost always miss our postie. Least if you do, now you won't miss your stationery fix, because the Paperhaul box slides perfectly through the letterbox. This months theme is travel and what says travel more than these lovely postcards. Several vintage inspired and one a more modern take on travel but all 3 printed on quality card ready to be placed in that big red box! Two quality printed cards which come blank. I love blank cards because you never know when someone could use a bit of cheering up. I love the bicycle card and I know there are several people who would appreciate these through their mail box. Vehicle inspired washi tape. I love washi tape but I am just too tight to spend £3 on various tapes so I often buy cheaper versions. The inclusion of washi tape was a real point for me when I described the contents and price to people curious about the box. 2 double sided craft papers. If you're like me you'll always have a preferred side with double sided papers and this is no exception. I like both sides but my favourite is the stamps and buildings. What's yours? Finally, what's a stationery box without stickers?! And in this months box, Paperhaul have popped in some landmark stickers which I'm thinking of sticking onto my envelopes for my American pen pal who will love them. I really can't wait to see what other themes Paperhaul come up with. I think travel was the perfect one to kick off their very first box. 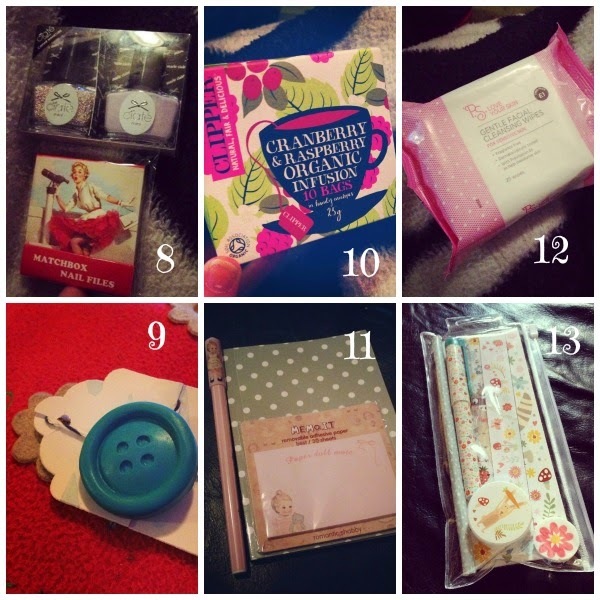 If you're interested in seeing what Paperhaul's future boxes have in store every month, they are priced at £10 plus p&p which I think is very reasonable. Each box sold also has 10p donated to the charity Post Pals which is a favourite charity of mine and is another reason to love Paperhaul for me. I've been very lucky to be chosen to blog the reveals each month and whilst my boxes will not be free I do receive them at a slightly reduced price. If you've received the first box, what do you think? I'd love to know! Three days ago we had parents evening for Midge. We were expecting the usual type of meeting much like year 1 where she was struggling with her maths but we were reassured that she was in a suitable group with children at the or around the same level as herself. 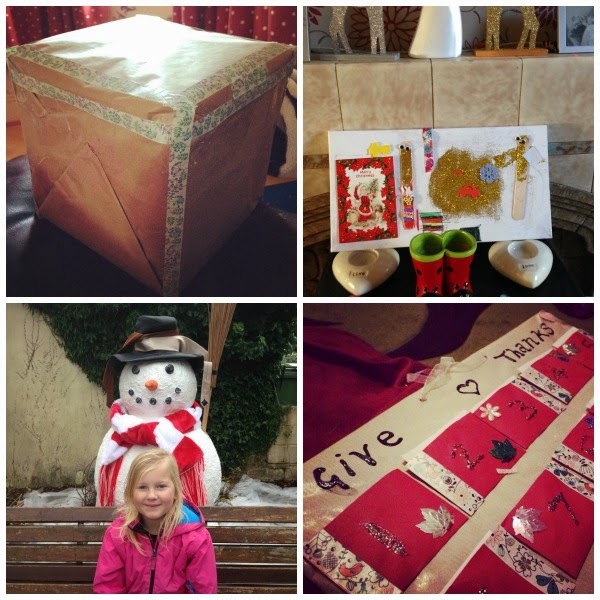 A day later Midge returned home with number lines and charts in her bag to help her. She was praised for finally moving up twice in her reading and to keep going. I was so pleased because she struggled to get a hang of reading. Her writing was pretty much like most of her peers and something that would improve. Well isn't year 2 just full of all the pressure? My daughter is 2 levels behind in maths, writing and reading. Her 91% attendance isn't really what the school are looking for. "Is she a sick child?" My husband was asked. Well not really, surly 91% says that? Apparently I should drag her in on our 25 minute walk with earache or tonsillitis or whatever else (only vomiting seems to be a line drawn) just so they can register her and then call me to come back again with my toddler to collect her. Sorry school, just no. She will improve on her attendance and I will think very carefully before choosing whether or not to send her in. Otherwise it's not happening. Maths was no surprise to us at all. I struggle and so does Hubby, if Midge inherited some super maths gene i'd be delighted for her but sadly that's not the case! I'm not entirely sure if she's in a group with the same or near abilities as her and I feel she could benefit from some 1-1 help with her maths but she doesn't appear to be looked at as a child who struggles that badly. Midge goes off into her own world with maths, she can rarely remember how her teachers show her how to do something so I'll have to see if I can get some ideas from the teachers so at home she's not being confused. There was no advice given on her maths a part from to know her 2,5&10 times table which is rubbish because she knows them by heart. Finally her writing. She needs to learn her capital letters and full stops which I completely agree with. When we have got them down I want to really concentrate on keeping her writing neat and tidy something they didn't mention but something which irritates me! They want her to use commas which I think is just a bit much at age six but hey, I think while it is important I have priorities and when she learns full stops and capital letters, then we will focus commas. I cannot help but feel my six year old is under too much pressure. Thankfully she loves school and doesn't seem to be feeling that pressure. Probably because she coasts along unaware of her government set expectations. That is how it will stay for as long as I can make it. As long as she is doing her best and I am helping her along I am proud of her. I know as she gets older I will hear of her interests and loves and probably hear how creative she is. Right now it feels schools don't care if your child tries hard, listens, is helpful and kind and welcoming to their peers. If they're not academic machines then we'll push them to be that, maybe not now but oh they will. And if they can't make them into that? Then they will be marked failures by our government. Its no surprise to me that home education is becoming more popular. Maybe one day I may feel this is a better option too. 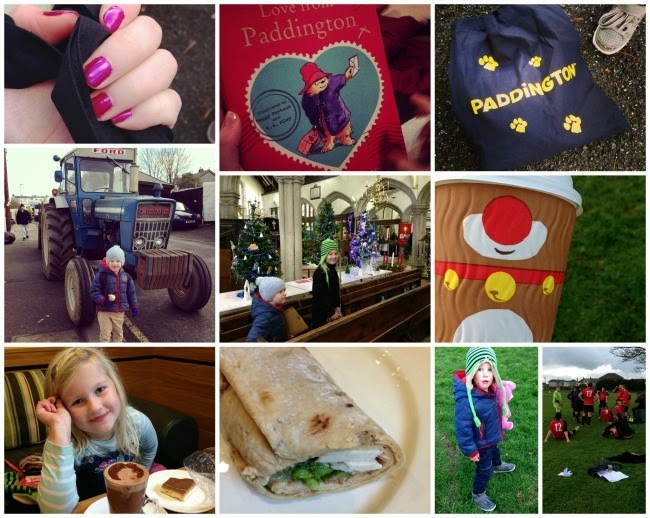 December is: Getting out those gloves and mittens, the knitted scarves and thick coats. Bundling up warm and doubling up on socks. Not to mention wearing leggings under those jeans for the super cold days. 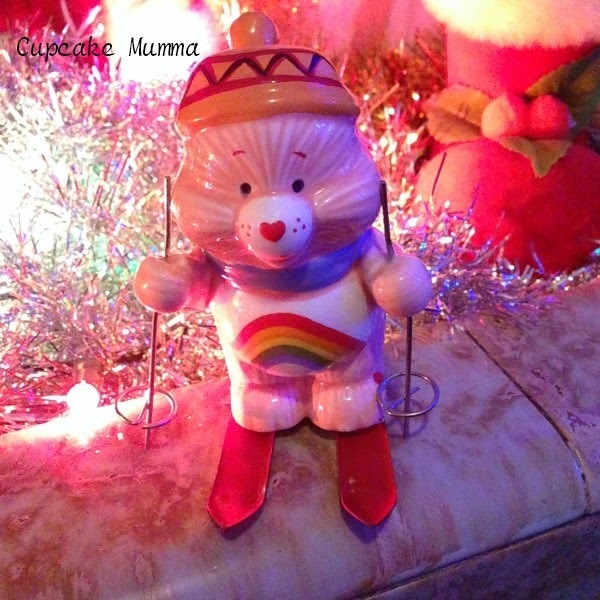 December is: Making cups of hot chocolate with chocolate sprinkles and plenty of marshmallows. If you're lucky; there's whipped cream on top too. December is: The month of planning and list making. Searching through catalogues and picking out thoughtful gifts. Writing your plans for delicious dinners and planning the extras to treat yourself to over the festive season. boxes of food in the food bank and perhaps some pennies left at the coffee shop to pay it forward. 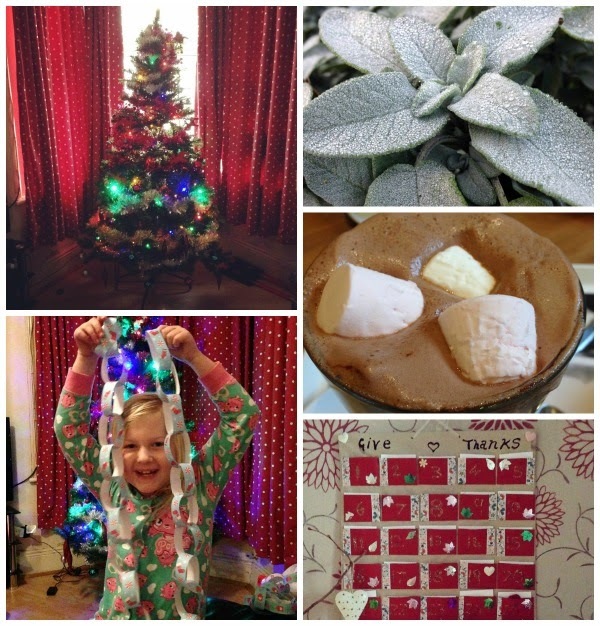 December is: Being covered in the fallen bits of tinsel and the glitter from your baubles as you decorate. Standing on fallen pine needles and feeling that happiness when your decs are up and looking wonderful. December is: Taking a stroll around the neighbourhoods and marvelling at the outside lights and pretty Christmas trees in the windows. December is: Secretly hoping for a White Christmas. 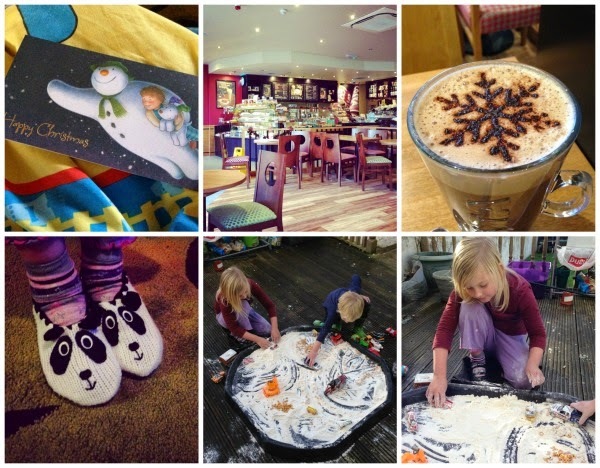 December is: Christmas fairs, nativity plays and Christmas carol concerts. Festive church crafts and Christmas bazaars and being offered raffle tickets at every shop you visit. December is: Remembering to be thankful. For all you have. December is: Soups and stews, big hearty breakfasts. Tea and cakes, mince pies with cream, Yule logs and roast dinners. December is: Not forgetting what it's really about. Have a wonderful end to 2014 all my amazing and loyal readers. I wish you nothing but the happiest Christmas and New Year. Now tell me, what is December to you? I'd love you to link up your posts below! Hello! Another week another week that was with the lovely Hannah. Enjoy! Monday was probably one of my best days this week and it was so refreshing to enjoy a Monday! Little A and I dropped Midge off at school then watched our usual 9:06 train at the station before heading into town. I decided not to bother with going home and stayed in town with Little A instead. We enjoyed a Costa together, then trotted off to the library before A announced he needed the loo and unfortunately the toilets there were still out of order meaning we had to go to the train station where we ended up staying for half an hour chatting and going through leaflets (nowhere else to go so close to nursery!) We watched the usual 12:02 train come in then went to nursery. I came home to do a few bits and bobs before returning for the afternoon pick up where both children had had a good day. By tea time things were getting their usual hectic so what a wonderful surprise it was to see hubby come through the door! He decided to come home early from work as his shoulder has been giving him grief (he works on factory lines) it was a lovely surprise! We ended the day with some paper chain making which was fun. On Tuesday we did our usual morning routines, a little more wrapped up than usual because the temperature seemed to have really dropped! Hubby and I picked the children up early from school to head to the dentists- eek! Midge was brilliant as usual and this time her teeth were very good. Little A made us very proud by letting the dentist look at his teeth this time so they both got stickers. Hubby and I were not so lucky! I have a tiny cavity and need a big filing elsewhere as does Hubby- oh dear! New year gifts to us! We rounded the day off with a chip shop tea as a treat. I also got to see my sister before she went back to uni with my parents the next day. Wednesday wasn't anything special but it was a relaxing day and those are good. Little A and I had a nice walk to nursery in the afternoon, he played about with leaves and we ate chocolate (naughty mum!) on the way home I had a rather rubbish anxiety moment in a store when they wouldn't take my vouchers which wasn't nice but I went home after sorting it out and tried pesto with pasta for the first time ever whilst watching the 2nd Harry Potter. On Thursday I planned to head to Penzance after the nursery drop off but soon changed my mind when I picked up what I thought was my parcel from the sorting office..it wasn't, it was my husband's new shoes *sigh* I wasn't going to go around with them so went into the local shops instead. I got a call from Hubby asking if I wanted to meet him so we had a lovely lunch in Weatherspoons. It was so, so good and we both left to pick the children up together after having a drink and a chat. On the way home we popped to Tesco for some extra bits and Midge let me take a photo of herself in the Elf face which was rather funny. Friday I received a prize in the post. It was a fantastic Paddington Bear haul from Love Reading. I was over the moon and so was Little A who opened it with me. Hubby had the day off and he went early to take Midge to school and do the food shopping. He also picked up Little A's carol concert outfit which I can't wait to see him in on Tuesday. On our way to nursery we spotted a very old-fashioned but lovely tractor which Little A had to have a photo taken next to. I also treated my nails to a bit of TLC with a lovely purple colour. Quite wintry I thought! On Saturday I had a lovely lay in then took the children to town to collect a few bits. We then went on to the church to see a few of their Christmas trees and see what they had to offer in the market. I felt really uncomfortable there and couldn't wait to leave. Little A bought a toy and Midge bought a book before leaving. I liked the fair trade stall and bought two lovely angels that had been made in Bangladesh. After we left, both children wanted to walk around the graveyard and we saw some squirrels which was nice. We headed to Costa for hot chocolates and cake and I had my first ever Turkey wrap. I've not eaten Turkey in over 13 years and it was pretty nice in the wrap but I won't be craving it at Christmas dinner! We looked in some charity stores then headed off to watch hubbies football game (which he won!) Dinner was a lovely pesto pasta salad which I enjoyed very much. Hubby went out for the night so I snuggled down and watched my 3rd Harry Potter film. 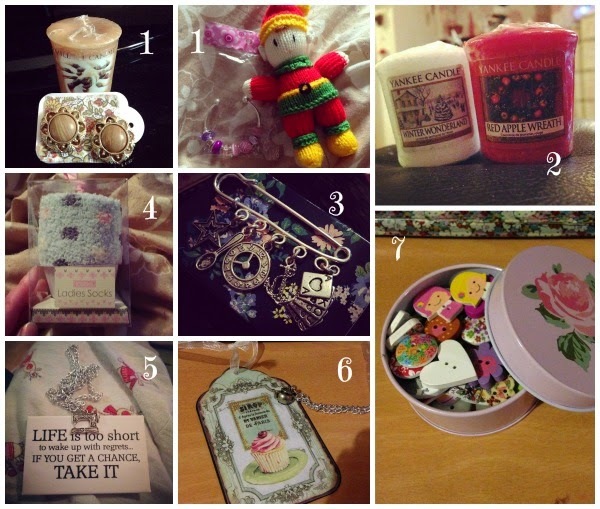 As an extra over the festive period, I'm going to show you my weekly Advent gifts from my swap partner. 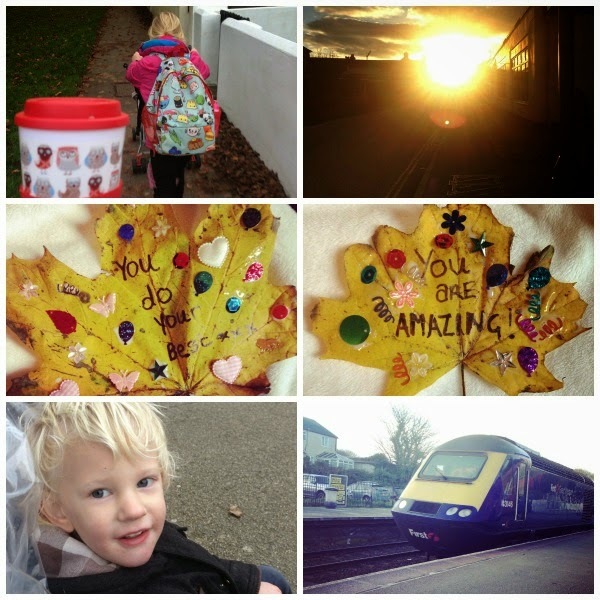 If you're on Instagram you'll see these so do pop on over and follow me and my lovely partner Yazmin. Sunday saw us be super lazy and have a yummy roast dinner. We did the usual getting organised for school and watching our 4th Harry Potter! Love it. Next week will see Little A's nursery concert, parents evening, a church craft day and well, goodness knows what else! Have a lovely week! After spending all weekend with two very tired children who had been coughing all the time, I decided Monday was to be a day off school and nursery. I made it clear it was to be a relaxing day therefore it meant we didn't get up to much other than watching TV, me doing chores and wrapping and posting my swap partners Advent swap gift. 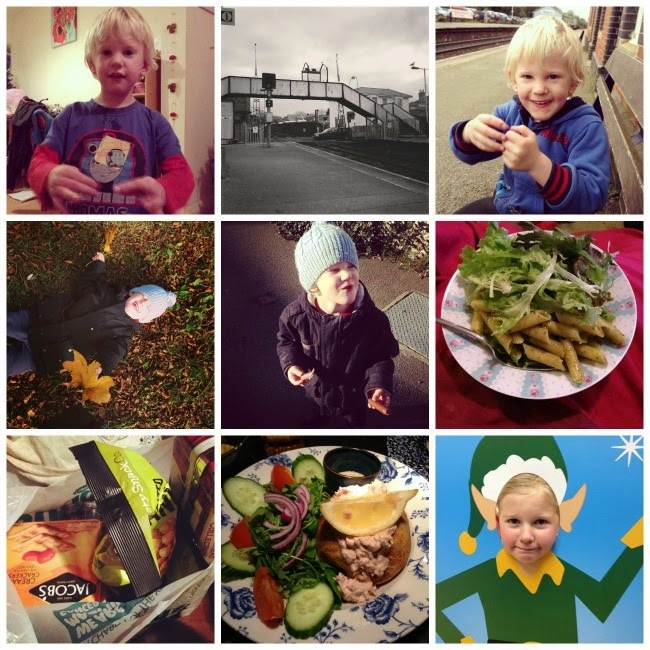 On Tuesday Little A was back to nursery and he had a great day. Midge woke with belly ache (which turned out to not be as bad as she had made out) I had to go to town to do some boring jobs but we found a snowman to hang out with for a little while so obviously I took a photo of that! When we got home I knew hubby was picking up Little A so Midge and I got some food and watched the first Harry Potter film snuggled under our duvets. On Wednesday I finally had a child free house during the day! I did a huge de-clutter in the house in preparation for Christmas decorations and the big day itself. I have 3 large bags to donate to charity and will need to do some dump runs one day soon! I also created some leafs with Little A before nursery today. If you follow Story of Mum then you'll know that this month has been all about leaving inspirational leaf notes around your local area. I had great fun making mine. On Thursday I had to be super organised. I tidied the house in preparation for my Dads visit (it was his birthday) I baked a cake and cooked a roast. They arrived before the children went to bed which was nice, then we had an adult dinner before my little sister made a surprise entrance which my parents just loved. She came back from university for a week and I know they were both over the moon with her arrival as was I! We had such a wonderful night. Friday was rather dismal. I woke feeling unwell and had to drag my backside to the school. Thankfully I perked up for the nursery run but I came home and did nothing all day! So no photos for Friday I'm afraid! Now Saturday was set to be another boring day. The children bickered a fair bit and I was still down in the dumps (but at least not feeling poorly) we watched Toy Story 2 and I did a nice risotto for tea. When Hubby returned from football I had spontaneously decided to get the decs out so we spent the evening sorting through them. He popped out and bought a new tree which he put up minus the decs and we spent the rest of the night drinking hot chocolate and watching my Desperate Housewives dvds! 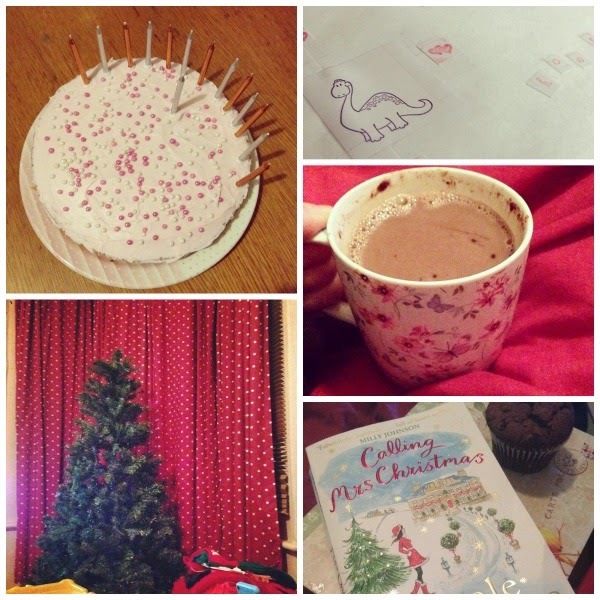 Dads birthday cake// Some happy mail from America// A rather yummy hot chocolate//A decorationless Christmas tree// My new read for the festive period and a yummy free from muffin!